One of the best ways to gain a quick and easy understanding of competitive archery is to watch a tournament in progress. This is a good idea for beginners who have never picked up a bow as well as for archers who want to start competing. By watching experienced archers shoot in competition, you can get a feel for tournament etiquette and the way the rules work. Chatting with the other spectators provides an excellent opportunity to ask questions and seek out advice from those who have been there before. Newcomers to the archery community often remark on how friendly archers can be, especially when a fellow archer asks for advice or help with an equipment problem. 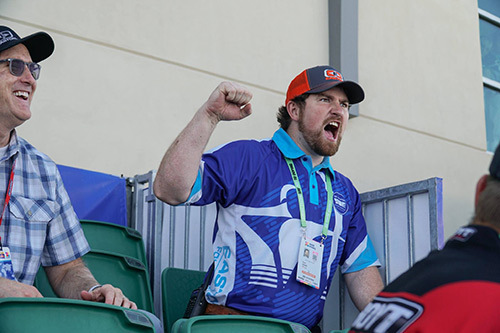 The odds are good that you will find a warm welcome at most tournaments, even competitions for elite archers like the World Archery Festival in Las Vegas, hosted annually by the National Field Archery Association or the Olympic Trials, hosted every four years by USA Archery. To find an event, the best place to begin is online. Try searching for smaller local events. Many archery clubs, city recreation programs, and Junior Olympic Archery Development (JOAD) programs have their own websites where they will post information about their upcoming events. Archery is unique among sports because no matter where you live, odds are good that you will be able to shoot all year round. Generally, the year is divided between “outdoor season” in the warmer months and “indoor season” in the colder months. Because of this, if you want to watch a tournament, then be prepared to visit outdoor tournaments during the spring and summer, and indoor tournaments in fall and winter. During outdoor season, tournaments are more numerous and archers compete at longer distances, facing challenges such as wind or rain. During indoor season, archers compete in more controlled conditions at closer distances, such as the standard 18m in USA Archery tournaments. Many choose to compete in tournaments throughout the year, but some archers prefer to focus their efforts on one season in particular. I Want To Compete. What Kind Of Tournament Is Right For Me? Tournaments can be great learning experiences, whether you are observing or competing. While most tournaments are open to archers of all skill levels, it is a good idea to begin shooting in small local tournaments. Then once you become comfortable with more advanced form and equipment you can work up to the larger state and regional, national, and even international tournaments. Keep in mind that eligibility into a tournament is usually based on membership to a national governing body like USA Archery or the National Field Archery Association, so you will want to register with the appropriate hosting organization in advance of the tournament day. If you plan to compete, it is also a good idea to contact the tournament director in advance to make sure you are eligible. Archers who prepare for a tournament in advance have a better chance of shooting improved scores and having more fun. When you are just starting out, concentrate on being as consistent during the tournament as you had been during your practice. At this point, it isn’t about winning or losing, but enjoying yourself and learning about the sport.